Immigration is a hot topic in both Europe and the United States; it always has been, for many decades, even centuries. Now it dominates the political agenda once again. The debate is driven by a deep worry that immigrants are competing for “our” jobs; often there is a tinge of ethnic bias. For much of the past 60 years, these tensions were eased because job growth exceeded population growth. However, the old engines of job creation are now stuttering. At the same time, isolated acts of terrorism are being used to give all immigrants a bad name – even though the majority of terrorist attacks are being carried out by citizens born and raised in the very country in which they are committed. Today, 244 million people are classed as international immigrants – more than 3% of the world’s population. The trend is clear: immigration is set to continue and is likely to rise. That means we have to figure out a way to make it work. We know it can be done – look at the United States, a country founded primarily by immigrants, or Brazil and Singapore, each with a cultural diversity deeply rooted in their immigrant communities. We need to get it right, not only to because we have a moral imperative to do so, but because the record shows that immigrant populations positively shape and contribute to the economies of their new homelands. We also know that countries that fail to integrate immigrants suffer economic and societal consequences. I recently attended a board meeting of a non-profit organization, where fellow board member and former US Secretary of State Condoleezza Rice spoke about assimilation. She said that “if an alien landed in the United States, they would surely be confused. Who are these Americans? They don’t look the same. And often they don’t even talk the same. Yet it’s clear something bonds them … together they build cities, marry each other, and even fight for one another”. Yet today many countries are struggling. In most of Europe, immigrant communities are living separate lives. 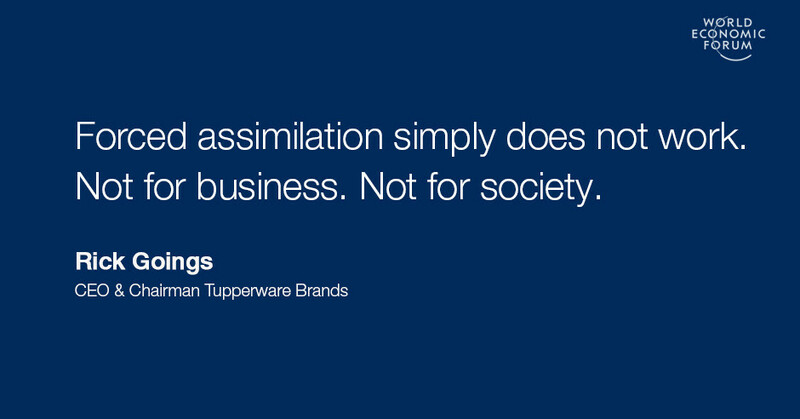 Assimilation is rarely smooth and happening slower than would be optimal. There is a reason for this: immigrants have been left to their own devices. Immigrants face numerous hurdles, and language is almost always the first and steepest. I am a third-generation Austrian-American. My great-grandmother lived in Chicago for 40 years, in a neighbourhood where everybody spoke her native German; she actually never learned to speak English. However, the barriers go beyond language. Immigrants often struggle to understand how their new country works – both a society’s obvious rules and the unwritten customs and patterns of do’s and don’ts. So how do we smooth the path of assimilation for immigrants in their new homeland? At Tupperware Brands, we have a diverse workforce of more than 3 million women operating around the world. We are good at managing a broad range of cultures; still, in each of our markets we face the challenges of working with members of new immigrant communities. To better understand the dynamics, we had a closer look at our German business, because Germany is home to more than 12 million immigrants, one of the largest immigrant populations in the world. The comprehensive assessment – A Study of the Migrant Experience within Tupperware Germany – was compiled by the Global Fairness Initiative (GFI), a not-for-profit organization based in Washington DC. GFI interviewed members of our sales force, both native Germans and first- and second-generation migrants, specifically from Turkey and Russia. Initially, we got it wrong as well. For years, we gave everybody identical support – both the locals and the migrants. However, “figure it out yourself” clearly was’nt the right approach and it led to a high failure rate. It was obvious that our German business leaders had to rethink the entire recruitment path for immigrants, to ensure they would successfully onboard and train them. So we changed the internal process to focus on learning, and working with the skills and qualities these women already possessed. Our approach shifted from “hit-or-miss assimilation” to smooth participation. We basically levelled the playing field by eliminating the potential barriers faced by immigrants entering the workforce. We provided tools that could be flexibly applied, ease their paths and built bridges. Tearing down barriers such as language and requirements for formal levels of education resulted in job opportunities and less discrimination. We shifted to help immigrant women work as peers, so that they could succeed based on their accomplishments, regardless of education, background or economic status. Language: Allow them to work in their native tongue … so translate all materials! After all, for some time their customers will be those most like them. Skills: Enough already about the tough cognitive skills taught in school! Persistence. Resilience. Reliability. Endurance. Compassion. Self- discipline. These “soft skills” are, in reality, essential skills. These essentials are not taught in any aspect of formal education yet are inherent in so many people. Coaching: Immigrants need a guiding hand, and who better to give this responsibility to than those who actually speak their language and understand their culture? Template: Provide a step-by-step formula to minimize mistakes and early failures. Create guiderails that develop and enhance positive experiences and build confidence. These four basic tools help immigrants participate and eventually integrate in the economy and society. They are transferable and can be used in many industries, from real estate and insurance to teaching. These tools can help build professional skills that will allow women – both native and migrant – to compete in a rapidly changing job market that is increasingly valuing transferrable essential skills over more narrow hard skills. New migrants in a new country usually depend on a “relationship connection” – friend, relatives or neighbours who act as their guide. Yet these are often relationships with people like themselves, and do little to achieve true participation. It’s convenient, but it creates ethnic ghettos and prolongs the assimilation process. So what kind of a “participation toolkit” can communities use? Well, back in 1928 there was a company called Welcome Wagon, founded in Memphis, Tennessee. Its purpose was to welcome new residents to a community; hostesses would visit new residents with a gift basket of product samples contributed by local businesses and discount coupons for services. They also included information on schools, the community and events. Importantly, the welcome pack also told them about health services and local government access. This concept flourished for more than 50 years. I think we should revisit this idea. Too often, officials see immigrants as a problem that needs to be administered, instead of an opportunity that we should all invest in. Imagine a public/private approach based on the Welcome Wagon template. It could be the starting point for building bridges. Instead of isolation, we provide the tools for participation. Crucially, we will succeed if we help immigrants combine the links in their ethnic community while building connections to their new home country around them. Forced assimilation simply does not work. Not for business. Not for society. We need to develop and deploy participation platforms that ensure immigration results not in problems but opportunities.